I have thick, relatively straight, extremely low-maintenance hair that also happens to have inexpensive taste. My routine (if you can even call it that) consists of washing with shampoo and conditioner every 2-3 days and working a smoothing product into towel-dried locks. I use dry shampoo on the roots sometimes, and occasionally I'll do an intensive hair mask. 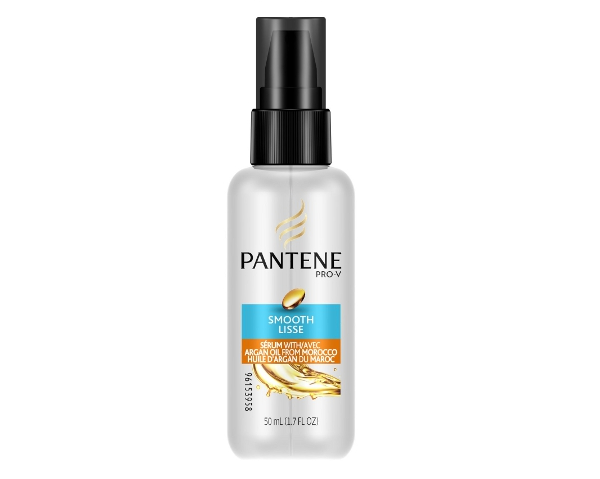 Pantene Smooth Serum with Argan Oil ($7.99 at London Drugs) fits into this minimalist haircare regimen seamlessly and is a breeze to use. The lightweight formula contains argan oil (although it relies on silicone to do a lot of the heavy lifting) and purports to fight humidity for 24 hours. I usually work 1-2 pumps into damp ends post-shower, then blow-dry my roots and let the rest air-dry. If I notice any frizz, I'll rub more product between my palms and lightly run my hands over everything. The result? Noticeable smoothness and shine immediately after I shampoo and well into the second day. The serum also gives air-dried ends a polished look—no frizz, just a natural-looking bit of texture and wave. Whether it's the silicone or the argan oil at play, this stuff works. Thumbs up.